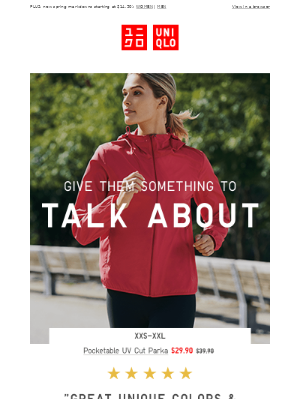 UNIQLO email example: Mickey + Minnie are back! 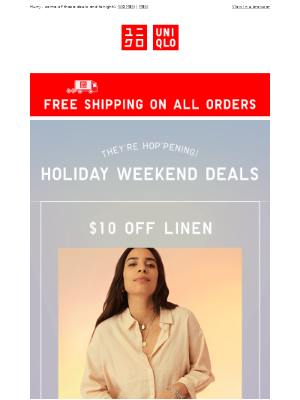 Buy more, save more on all graphic tees! Subject: Mickey + Minnie are back! Buy more, save more on all graphic tees! 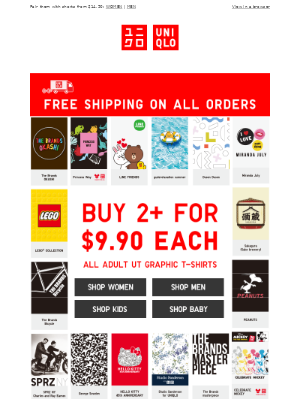 Plus, get EARLY ACCESS to MARVEL when you download the app: DOWNLOAD NOW View in a browser UNIQLO YOUR SHOPPING CART BUY 2+ GRPHIC TEES FOR $9.90 EACH MICKEY BLUE - SHOP WOMEN MICKEY BLUE - SHOP MEN MICKEY BLUE - SHOP KIDS MICKEY BLUE - SHOP TODDLERS WOMEN GRAPHIC T-SHIRTS - BUY 2+ FOR $9.90 EACH, RELACO 3/4 SHORTS $14.90 MEN GRAPHIC T-SHIRTS - BUY 2+ FOR $9.90 EACH, LIGHT COTTON EASY SHORTS $14.90 KIDS GRAPHIC T-SHIRTS - BUY 2+ FOR $7.90 EACH TODDLERS CROPPED LEGGINGS $7.90 WOMEN COMPRESSION HIGH-RISE SKINNY JEANS $29.90 - SHOP WOMEN MEN SKINNY FIT COLOR JEANS $29.90 - SHOP MEN MARVEL COMICS X JASON POLAN DOWNLOAD THE UNIQLO APP FOR EARLY ACCESS DOWNLOAD ON THE APP STORE BUY MORE, SAVE MORE - SHOP MEN BUY MORE, SAVE MORE BUY 2+ FOR $9.90 EACH ALL ADULT UT GRAPHIC T-SHIRTS, BUY 2+ FOR $7.90 EACH ALL KIDS UT GRAPHIC T-SHIRTS BUY MORE, SAVE MORE - SHOP WOMEN BUY MORE, SAVE MORE - SHOP MEN BUY MORE, SAVE MORE - SHOP KIDS BUY MORE, SAVE MORE - SHOP BABY FREE SHIPPING ON ORDERS $75+ UQ-WOMEN UQ-MEN UQ-GIRLS UQ-BOYS UQ-SALE UQ-NEW ARRIVALS UQ-LIMITED-TIME OFFERS EXTENDED SIZES LOVE UNIQLO uniqlo-logo INSTAGRAM FACEBOOK PINTEREST TWITTER FIND A STORE VIEW CAREERS UQ-IOS APP UQ-GOOGLE APP UNSUBSCRIBE | CUSTOMER SUPPORT Don't miss out, add email@usa.uniqlo.com to your address book to make sure you get our emails. 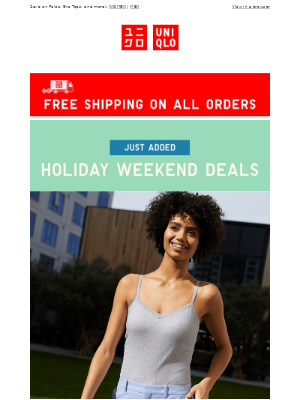 UNIQLO USA LLC 546-548 Main, 3rd floor New York NY 00000 | UNIQLO.COM *Colors, styles, prices and promotions may vary by location (online and in stores).